We don’t have a planned club event, but if you plan to operate in the field, feel free to post and invite others! Exchange: Missouri Fixed stations will provide callsign, RST, and a three letter county code (JAS, NWT, etc). Missouri stations can work anyone and get multipliers for MO counties, US States, and Canadian provinces. 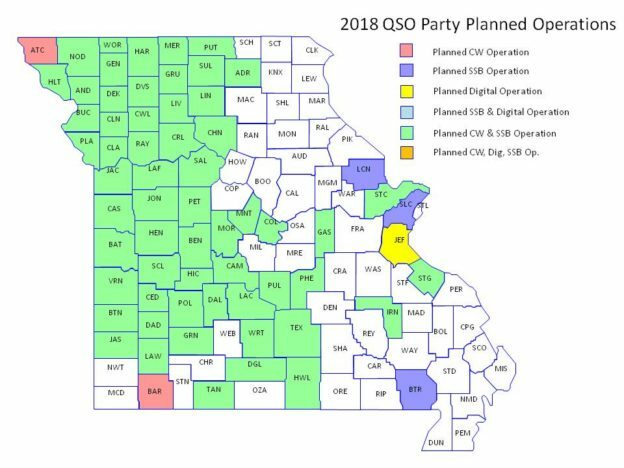 Non-Missouri stations will provide callsign, RST, and their US state, can work MO stations and get multipliers for MO counties. This entry was posted in QSO Party on 2018-03-30 by KØJAA.